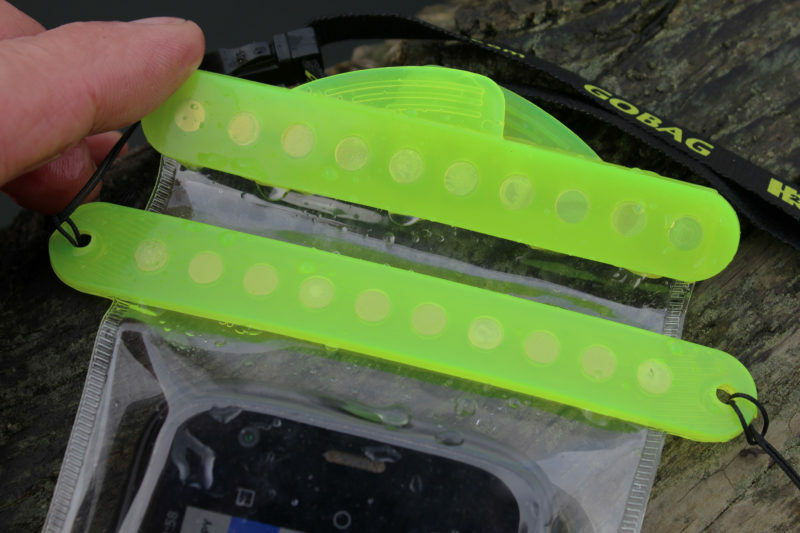 The Minnow, shown here, is the smallest in the GoBag line and a snug fit for a MotoG smartphone. For years, I kept my cell phone in a resealable plastic bag that was originally packaging for dried fruit. I knew that a critical and expensive piece of equipment should have a more secure means of protection, but I wasn’t impressed by dry bags designed for electronics. Each seemed likely to leak if I didn’t roll or zip the opening tightly enough. Magnets embedded in flexible strips make the GoBag self-closing. The magnets can attract iron particles from sand and soil; it is important to keep the sealing surfaces clean to assure a watertight seal. 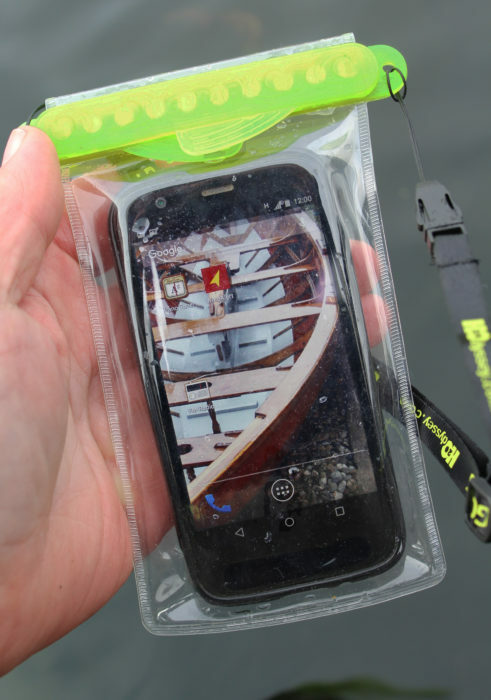 I recently upgraded to a new smart phone and decided that a reliable dry bag was in order. The staff at my local kayak shop pointed me to the GoBag, manufactured by H2Odyssey, a longtime scuba, surf, and watersports company. It is an envelope of clear TPU (thermoplastic polyurethane) film with an unusual closure system. The top of the Dolphin model I bought has two thick, sturdy flexible plastic strips, each studded with 12 powerful magnets. The two strips snap together quickly and automatically, sealing the bag. Once secured, this row of magnets folds down onto a second row of a dozen magnets, forming a tight double seal that further inhibits water from infiltrating the opening. 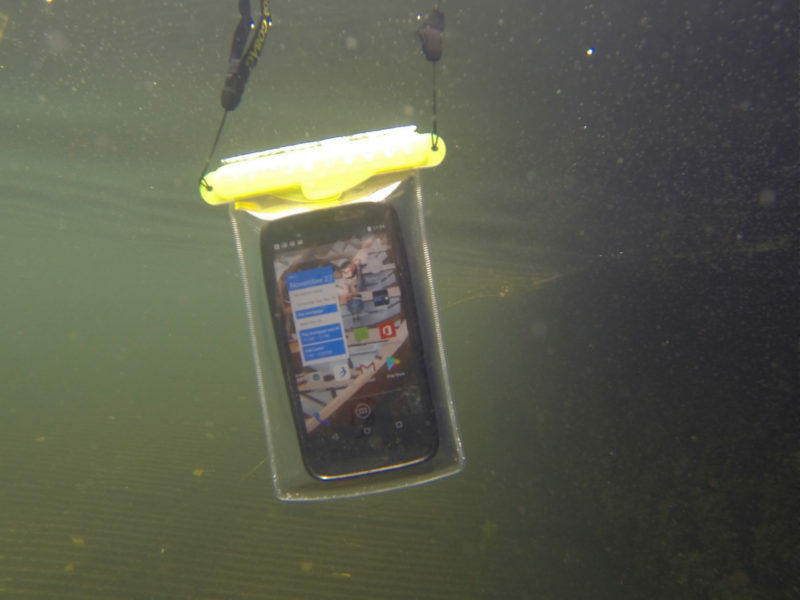 During immersion tests in the middle of a lake, the GoBag Minnow shown here endured a half dozen trips to the bottom, around 45′ deep, without any leaks. Tissue paper was used in the bag for the test to safely indicate any intrusion of water. The seal is so tight that I can’t squeeze excess air out after closing the bag. Having a bubble of air around the phone makes it difficult to operate, so the air must be squeezed out before the bag is closed. Once sealed, the bag is completely waterproof and is rated by the manufacturer for depths of up to 100 feet. The transparent TPU film allows full operation of the touchscreen, camera, and telephone functions of my phone. With the GoBag I can safely operate my GoPro camera using the app on my phone, confident it won’t get wet. Further, the clear plastic doesn’t significantly affect the quality of photos I take with the phone’s camera, an advantage when taking a quick shot or video on a splashy or rainy day when I’d hesitate to use my bulky, more vulnerable camera. The GoBag comes in a range of sizes that will accommodate devices from small smart phones to tablets as large as 8″ by 11″, which could be useful if you’re using navigation software on a tablet. If your phone is in a rubberized case, get a slightly larger bag to allow easy in and out. Even for a penny-pinching person like me, the GoBag is a worthwhile investment for protecting critical electronic devices. Bruce Bateau sails and rows traditional boats with a modern twist in Portland, Oregon. His stories and adventures can be found at his website, Terrapin Tales. The GoBag is available from GoBagPro.com. Prices range from $24.99 to $44.99. Looks useful. Will it float the phone? Or can you go oversize a little? In the third photo, my phone is in the water and hanging from its strap and would sink without be held up. Going oversize won’t provide flotation unless you find a way to retain some air in the bag. And while that might keep the phone from sinking but the airspace could make it more difficult to operate the phone’s touch screen.